Have you gone gluten-free and you're missing having a donut every now and then? We've got a simple Chocolate Donut recipe made with Garbanzo Bean Flour that will satisfy your cravings. Now you don't have to say good-bye to your Saturday morning donut, you'll be amazed that these are gluten free. Plus, being made with the Garbanzo Bean Flour, they are packed full of protein. What a great way to sneak some beans into your kiddos diet! Enjoy your Saturday morning favorite...gluten free! In a large mixing bowl, whisk together the sugar, flours, xanthum gum, cocoa, baking powder and soda, and salt. Stir in the egg, vanilla, butter, sour cream and milk until thoroughly mixed. Transfer the batter to a gallon size zip loc bag and snip the corner off. Fill the depressions in your greased donut pan with the batter. Bake for approximately 15 minutes or until an inserted tooth pick comes out clean. Cool in the pan for 5 minutes and then transfer to a cooling rack. 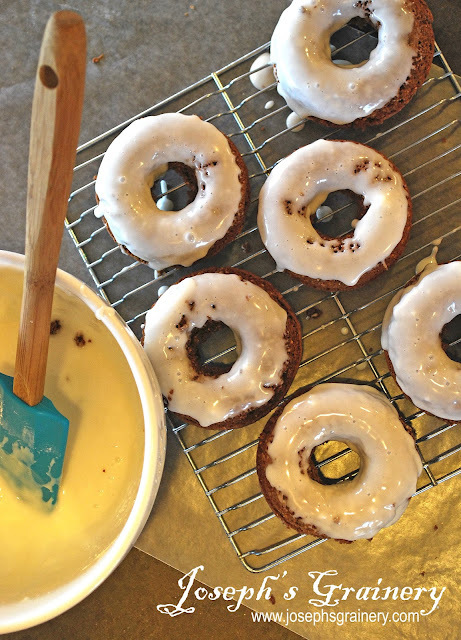 While the donuts are cooling, in a small bowl, stir together the glaze ingredients until smooth. If the glaze is too thick, thin with a teaspoon or two of milk. Spoon the glaze over the donuts. The glaze sets in about 10 minutes, depending on the thickness.